In the long run, these benefits can be expected to improve communities while saving taxpayer money. 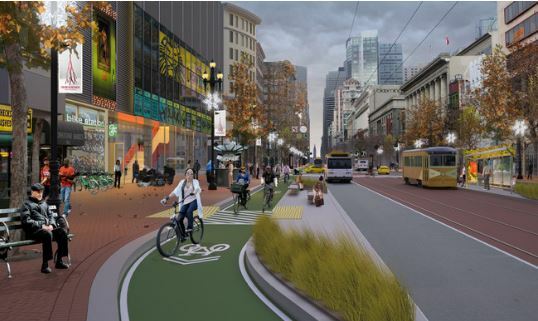 Some of the techniques for designing slower streets involve implementing bike lanes, beautifying pedestrian pathways, adding seating, creating traffic buffers, and improving public transportation options. 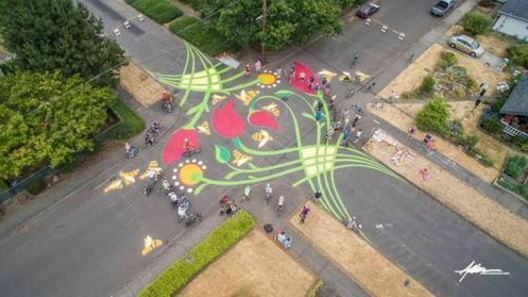 However, creating slow, community oriented streets can be as simple as the addition of a well placed art piece, as demonstrated by Mark Lakeman’s City Repair Project in Portland. Among other initiatives, City Repair helps communities establish street murals, mostly in intersections. These murals slow traffic speeds as drivers become more cautious around the unfamiliar conditions, making the area safer for other forms of transportation and encouraging community interaction. This accessible form of street design helps individuals reclaim their communities’ streets without the need to involve government. So, even if you are not a city planner, something as simple as a piece of art could encourage slower streets and make a difference in your own neighborhood.